From Salt Lake City, take I-15N until it turns into 89N. Take the Huntsville exit, drive through the Canyon and take exit 92 for Huntsville. Follow the road into the mountains for the next 10-15 minutes. Enjoy! The weather had been moody here in northern Utah. As my wife and I drove back from Ogden dark clouds rolled over the mountains from the east but to the west some open sky was visible. As we arrived home I was curious to see what was really going on up in the mountains. She knew the look and said be safe as I departed. And as I drove indeed, big drops of rain started hitting the car with force and my gas light started flashing, I was driving on fumes. This was starting well! Forced to pull over and fill up the tank, the rain REALLY started coming down in buckets and the thought "I am wasting my time!" blinked in my head but hey, I was here so the decision was made to carry on. As I started my ascent up HW 167 past Mt Green, the rain halted but dark clouds hung over the Wasatch mountains, drama unfolding as the light started to go haywire from the frenzied atmosphere. I stopped to capture the moments, but drove on higher, anxious to see what I could see. Finally I made an illegal turn and pulled off the shoulder of the road, grabbing my trusty E-M5KII and my Panasonic 35-100mm lens as I hurled myself out of the car. I literally ran as the sight before me was stunning. The autumn foliage was there, fading but still alive however what truly caught my eye was the sky. 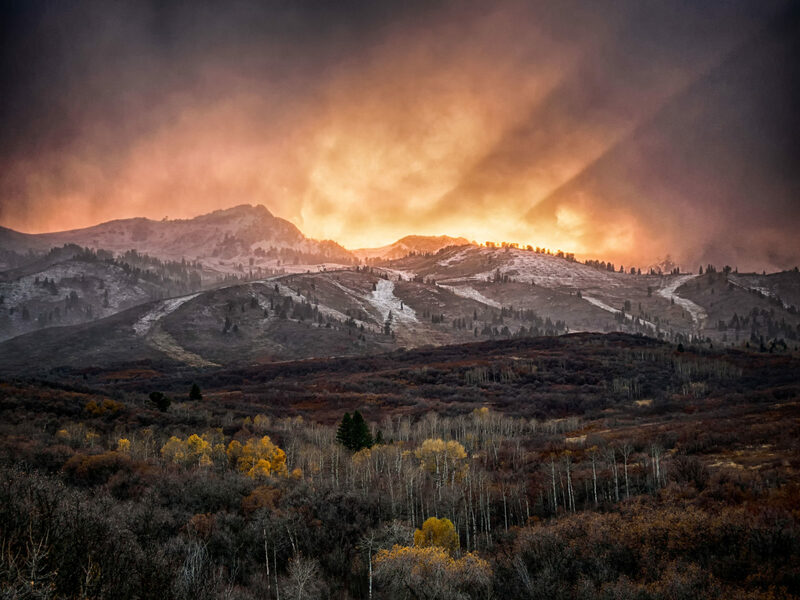 The clouds had pulled back and light from the setting sun struck the Snowbasin mountain, transforming it into the home of the ancient Greeks, this Mount Olympus setting it afire. Quickly, the light began to fade, the clouds closing the door to the temple but not before I was treated to a fleeting but beautiful, intimate, moment....twilight of the Gods.